Hello all! I’m excited to be back on here to update you on my adventures as a second year teacher. School in my district started this week, which to be honest seems way earlier than when I was in school. Summers don’t have quite the same connotation to teachers and students as they once did. With that said, I did have a great summer regardless. I finished up my master’s program (CADRE) in June. I went on a 2,800 mile road trip with my hubby and 3 sons… it was awesome! All-in-all, my summer was pretty full and rewarding. So, about that unexpected surprise… yesterday I didn’t quite feel right. I was kinda sad and felt like something was missing. I couldn’t quite figure it out. I noticed that I’d look at a student and would mention that so-and-so looks like so-and-so from last year, or talks like that person, or acts like that person, or has the same name. 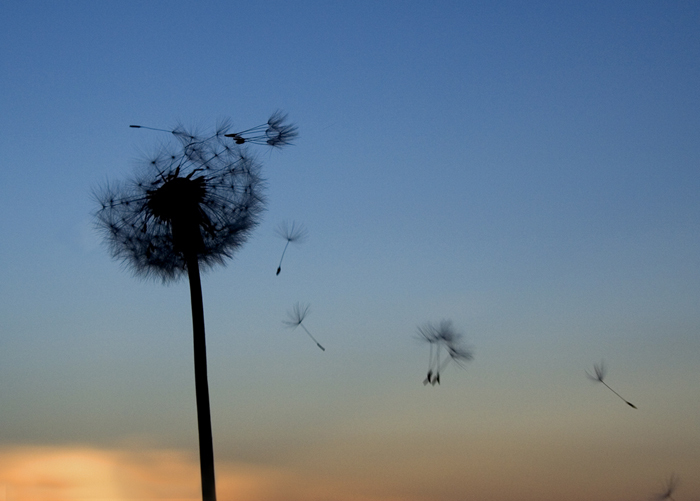 By the end of the day I was worn out and depressed, but I didn’t know why… then it hit me. I was mourning the loss of my students from last year. They were gone and I wasn’t going to see them again unless they visited me. This revelation caused me to start crying like I lost a loved one. It was horrible and not something that I’ve ever heard another teacher talk about. In fact, I’m crying right now writing about it. What’s even worse is that I was practically shoving them out of the door on the last day last year… now I want them back. I think that what this shows me is that I truly care for my students and that we built some really strong relationships with each other. I hope that this will be the case for me this year as well, and maybe instead of pushing them out the door on the last day, I will savor those last minutes with a new sense of knowing that I may never see them again but that we made a difference in each other’s lives. Well, I need to get back to working on my class syllabus and preparing for open house. I will post again soon. I apologize… I thought I had posted about my last days of school awhile ago, but I can’t find that post… darn iPad app, lol. My last day of school, with students, was on Wednesday June 1st. My time teaching 8th grade has been very interesting and educational, not just for the kids but also for me. But now, I need to take the summer to reflect on the past year and plan for the future. I was surprised by how emotional the kids were… although, I think some of the girls thrive on drama and really played that part well. 🙂 There were lots of hugs and tears, and some surprises… One in particular really caught me off guard. One of my students, who was new to the school this year, wrote me a letter telling me how much I made a difference in her life and how appreciative of me she was. It was really amazing actually. I have never received such a humbling and heartfelt gift! Then, on June 3rd, I presented on NBPTS’ Proposition 3: Teachers are responsible for managing and monitoring student learning. My presentation focused on creating classroom rules based on Be Safe, Be Respectful, Be Responsible (this was discussed in an earlier post). The presentation was done in the presence of other teachers, administration, family, and friends. I feel like this was a great way to show off my final portfolio and to listen to what my fellow CADRE members learned over the course of the year. I finished the CADRE program on June 30th. I have never been so relieved in my life. 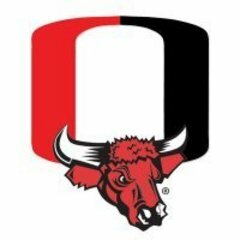 I loved having the opportunity and privilege to get my Master’s Degree through the UNO CADRE Program… it has been the best and hardest time of my educational career… so far. I hope to continue my education, but I think it’s time for a little break. Have a great summer everyone! I will post again soon. Closing out a wonderful year! YAY! I made it! … well, almost. We don’t get out for a little over a week, but it’ll be a breeze. This year has been amazing, educational, insightful (both about myself and my profession), and really hard; however, I wouldn’t give up my first year teaching for anything. I believe I have been blessed to have such a wonderful group of kids this year. I have been fortunate to have a great cohort of teachers to help me through my Master’s program. I have definitely been lucky to have had the stamina and strength to handle all of the challenges and pressures that come along with teaching 13 and 14 year olds. Today my fingers itched to start taking down my bulletin boards and posters, to pack my boxes of teacher paraphernalia, and to begin the process of planning for next year, but, I didn’t start. It will be hard for me to say good-bye to this bunch of kids, but it will hurt them to see me putting the year behind me before they are gone. Tears will be shed, but they will be tears of joy and excitement. Hugs will be shared, but they will be hugs of congratulation. High-fives will fly and knuckle-pounds will explode, all because we made it… students and teachers alike. Good-byes will be said, and for some it may be for good… but for me and my fellow teachers, we will hope for a future glimpse of the student we taught, just for a second, when they were developing into their adulthood. I am so proud of what I’ve done over this last year, and I’m proud of who I’ve become; but, most of all, I’m proud of the lives who have touched mine, just for a second, when I was developing into my profession. It has been the exuberance… and trust… and trials… that these kids — my kids — have spread over my first year of teaching that will forever resonate in my heart. I wish, just as most teachers wish, that I will not be forgotten. I will never forget my first year as a teacher. P.S. I guess I get to add a new tagline to my blog in a few weeks 🙂 I will no longer be a first year teacher! It really hurts and confuses me when kids believe that suicide is the best answer to their problems. Since I teach at a middle school, suicide becomes an increasing problem in these young people’s lives. My 8th graders are going through a very tough time in their lives; they are going through the bodily and emotional changes that everyone goes through at this age. I remember clearly how difficult that was for me, especially since I moved from one state to another in the middle of my 7th grade year. But why does suicide sound like the answer? When I was 16, I was going through a really tough time, and I remember telling my mom that I wished I had the courage to kill myself. She looked at me very seriously and said, “Suicide causes so much harm to the people who love you and it is the most selfish thing you could ever do.” When I think back to that moment, I remember the shame and fear that I felt, because I knew that I couldn’t go through with it, but I also knew I said it because 1. I wanted to hurt my mom, and 2. I was asking for help by shifting the attention, albeit negative, to me. I was hurting emotionally and I didn’t know why. I had next to zero self-esteem and I perceived the world as my enemy, one that didn’t like or love me. I was convinced that I was going to feel that way forever. After that, I always think about how selfish suicide is and how it is a permanent solution to the person who takes their own life, but it is a life long scar to those left behind. Here is an article about teen suicide statistics and risk factors. There are also links about related issues and suicide prevention. This is a growing epidemic that is quickly becoming the #1 cause of teen deaths. Bullying, in its many forms, is on the rise, which I’m sure is causing teen suicides to also increase. You may be asking yourself why I’m writing about this. Why now? Well… I know of a girl who has tried upwards of 3 times to take her own life. She is only 14. Her family is extremely supportive and has been actively seeking the appropriate help… however, it just hurts to know that if she keeps trying, she will eventually be successful. I graduated with my Master’s… who’d of thunk it? I did it! Yes, ladies and gentlemen… I did get my Master’s degree… well, I walked yesterday. I still have three classes to take in June, but once those are done, I’ll be totally done with my degree. It has been a very long year. Last summer I started a very intense accelerated Master’s degree program called CADRE. Then, in August, I began my first year teaching… while still going to school.So… I feel like this is a good time to reflect a little. I remember when I started CADRE, I thought it was going to be a breeze. I was wrong. Looking back, I can see how naive I really was. I had been going to school full-time for quite a while prior to beginning my Master’s program, but it was nothing compared to going to school, raising a family, AND teaching my first year. Some of my CADRE classes were really beneficial and some were not, which I think is typical of most Master’s programs. Regardless, I took everything I could from each of my classes. I have written over 130 pages for various papers, which have included: five papers on the NBPTS core propositions, one prospectus, one action research paper, and others. I created an interdisciplinary unit over South America, of which I was the group leader and the co-author of the science/reading portion of the IDU… science? I know… that was fun *hint of sarcasm*. Lol… anyway… I have these experiences to use for future growth, which is really important to me. I can do anything and be able to take something from it to help me grow as a teacher. I refuse to do anything for nothing, which is why CADRE has been so helpful. The seminar classes that I’ve attended have helped me really reflect on my teaching and ask myself some tough questions… all to help me grow as a teacher. I have come so far over the last year… more than I thought possible. I will be putting my CADRE portfolio together over the next few days, which is going to be awesome. I’m planning on a totally paperless portfolio, which I don’t think has been done prior to this year (I could be wrong, but I don’t think so). I will defend my portfolio on May 26th, and on June 3rd I will present on the NBPTS core proposition 3… “Teachers are responsible for managing and monitoring student learning”. So, how was all of this possible? I definitely couldn’t have done this on my own. I am so lucky to have a family who cares so much about our future that they would support me during this time. My mom who has provided free daycare for the past six years… that alone is worth so much more than I can ever repay. My husband, who I might add has become “Mr. Mom”… he takes care of the house, kids’ appts and school stuff, bills, scheduling of activities, cooking, etc. He has done it all. My kids for not resenting me these last years… I haven’t been as available to them as I think I should have been; however, they know that they will have a better future because of these sacrifices. Well… I had that moment last night. It was embarrassing and stupid, but I couldn’t seem to do anything about it. I have been beyond stressed these last months and rather than letting off steam during that time, I let it build up until I blew. Actually… it was probably a good thing that it happened when it did, because these types of emotional releases always get my rear in gear so I can get some work done, which probably would have gotten done sooner if I hadn’t been such a procrastinator and let it get me stressed out… I digress. In CADRE we implement the Five Core Propositions, as defined by the National Board of Professional Teaching Standards (NBPTS), in our classrooms. We then select three artifacts for each proposition and write a very in-depth analysis and reflection of each artifact and the proposition. These are due in, oh…. a couple of weeks. And I have 2.5 written… yeah, I know right? I’m a total procrastinator. So, after my meltdown, which I’m sure would make any 2-year-old look like an angel, I wrote a 5 page outline for prop 2 and have the skeleton for my prop 4 outline finished. I even finished most of the research. Yay me! Now… there was a cause to what set me off… but that shouldn’t be an excuse. I really need to learn how to break through those really tough walls that prevent me from moving on in my work… something like writer’s block, I guess. 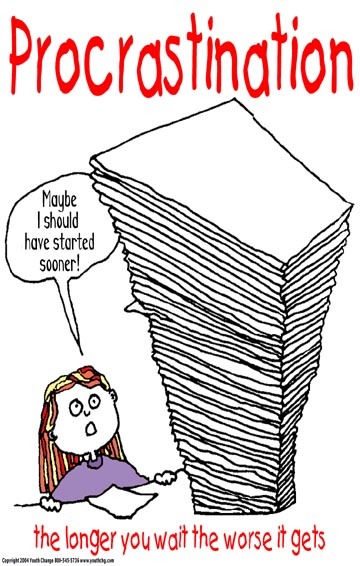 This is a recurring goal of mine… don’t procrastinate, no matter the reason. 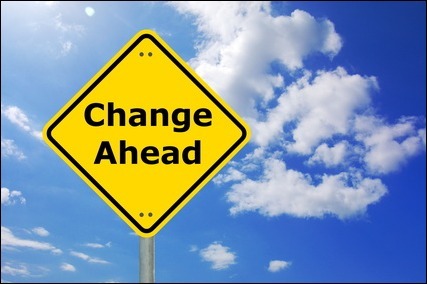 So, what I’m trying to say is that if I really want anything in my life to change, I have to change it. It takes a dedicated and focused person to change an aspect of their personality that has been habit for so long. I’m going to try very hard to make this happen… I am focused! I will get to the end of this program, and I will be a great teacher. I just need to take the action. Anyway, the end is in sight! … t-minus 23 days and counting until I graduate with my Master’s. Too late to mail those invites? Probably… but, I’ll do it regardless. 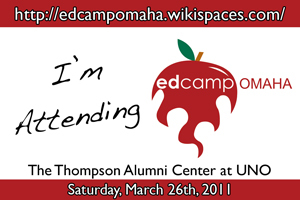 Anyways… I’m excited to see what this EdCamp collaboration is all about. In the CADRE program, we are encouraged to collaborate with other teachers, both new and experienced, to find out what is working and what isn’t. This first year of teaching has been one of learning experiences and self-discovery. I had these really fabulous ideas about how to run my classroom, before I started teaching, but after trying to incorporate them into my classroom, I discovered that my amazing ideas are oftentimes only amazing in my head. So, I go to my cohort of teachers, both at my school and in the CADRE program, and tell them what I tried and ask them what works for them. This process seems to let me practice my independence and creativity, but when something doesn’t work, I can adapt and rely on my network of professionals to find something that does. EdCamps have been popping up around the country lately as a way for teachers to gather together informally to discuss issues that are important to them, without the registration fees, travel expenses or corporate agendas of larger conferences. The schedule of discussions for the day is generated by the attendees on a whiteboard, and through the day people are free to move from discussion to discussion as they are interested. P.S. Thanks to all of you who reply to my posts. I really appreciate all of your thoughts. I just hope that we can all do a little more than “get through” the day when we teach… I hope we can all change a life!